Now that the holidays are behind us many people will be trying to tighten their belts – in more ways than one. Diets will begin as we all try to shed those extra pounds gained by overindulging in rich, decadent foods. At the same time, holiday spending guilt will no doubt force others to slash their budgets or take on extra work to pay for it all. But when it comes to cutting budgets, one line item that nearly always takes a hit is the food budget. If you find yourself needing to cut yours back, here are 7 effective ways to stretch your meal money and your budget. One effective way to stretch your meal money is to substitute your meat with a different protein. For example, instead of buying expensive sandwich meat for lunches try changing to a good old peanut butter and jelly sandwich instead. Another couple of options are to serve eggs, beans, or lentils for a meal. These options can be cheaper than beef, pork, chicken, and fish and still provide a lot of nutrition for you and your family. Many people keep a stocked pantry, refrigerator, and at least one freezer. Why not shop your own cupboards and try to use what you have on hand rather than buying more? This is one great way to eliminate waste and stretch your meal money. Getting creative and experimenting with your meals will also help you use what you have and stretch your meal money. Try using leftover potatoes to make a shepherd’s pie. Or, add meat to other ingredients for a cost cutting casserole. Don’t forget that if the sell by date has passed it doesn’t mean you absolutely must throw away that food item. It may not actually be spoiled so check it before you toss it. 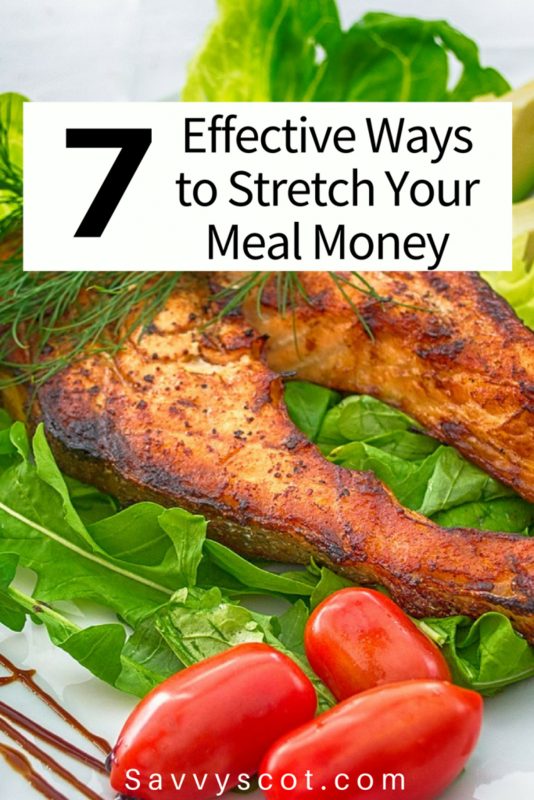 Needing other effective ways to stretch your meal money? Try actually making a grocery list and sticking to it when you shop. Don’t buy off the end caps because products are sometimes higher rather than being on sale as you might think. Only put on your list what you need to compliment what you already have on hand at home. This doesn’t include desserts, soda pop, or alcohol. These choices provide empty calories that cost a lot but don’t fill you up and are not at all nutritious. Slow cookers are wonderful kitchen tools that can help you stretch your meal money and make your life easier. Brown a pound of hamburger, drain it, and add beef broth and vegetables for a hearty, economical soup that can cook while you are at work all day. Or, add a couple of cans of beans, some spices, and crushed tomatoes to that hamburger for some world class chili instead. The versatility of a crock pot even allows you to cook vegetables and rice to go with your main entre. If your budget is tight but you have plenty of time, shop the sales ads from your local grocery store and increase your savings by adding coupons. You may be able to triple it with store loyalty programs if you sign up before you shop. When the shelves are empty of a sale item on your list, ask for a rain check. Once the product has been restocked you might be able to use the slip to get it at the sale price even if the store sale is over. Not all foods can be purchased in bulk as one of the effective ways to stretch your meal money, but there are some that can. Get your rice, beans, flour, sugar, and other basics in bulk. Store them in air tight containers to extend the shelf life and you can save money when your budget is tight. Are you getting groceries from a grocery delivery service? If so, cancel your subscription right away. The food is not always fresher and it will likely cost you more than buying it yourself in the store. Budgets get tight for everyone from time to time. No matter what reason yours is, there are 7 effective ways to stretch your meal money and help you get back on track. How do you stretch your meal money when trying to keep costs down?